My mom's friends hosted a shower for my sister months ago - not long after she had Jack. Many of them have known my mom longer than Heather and I have been alive, so it seemed fitting to share the new addition to the family with them. I have to tell you, one of the things you immediately notice when these ladies congregate is how tiny they are - a tribe of feisty five-footers. And they are organized. Like a small colony of bees - on the day of the shower everyone had an important job to do. I snuck into the kitchen just before lunch was served and saw a huge green salad. Next to it were three deliciously rustic savory pies. As one was being cut and plated, I started asking questions. As it turns out, I was looking a noodle-free lasagna baked in a pie crust - layers of zucchini, ricotta, and tomato sauce. And lots of cheese. I've been meaning to do my own version ever since. When I finally got around to putting this idea in motion, I switched things up a bit. For starters, I did a tart version instead of pie. But you could do either, really. I riffed on Clotilde's Easy Olive Oil Tart Dough for the the crust, and kept things pretty straight-forward beyond that. I scaled back on the cheese. A lot. I mean, there is plenty of ricotta in this tart, but nothing compared to the original. In addition to the cheese inside the the original, it was also topped with a thick layer of mozzarella. I think the source of the original recipe might have been a vintage Junior League cookbook, but I'm not positive. You can certainly experiment depending on the season and what ingredients you have on hand. Just keep in mind that you are going to want to keep the ingredients relatively simple, not too wet (there is lots of moisture in the ricotta and sauce), and quick-cooking. You could put chopped herbs, or a spice blend in the crust - lots of different directions to take this. You can do this with any par-baked pie or tart shell you like. Next time around I might experiment with a Parmesan tart crust like this one, or add some herbs to this version. Start by tossing the sliced zucchini with the salt in a medium bowl. 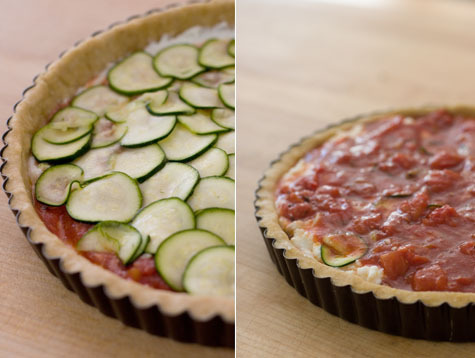 Transfer the zucchini to a colander and let it drain while you make the tart shell and tomato sauce. To make the tart shell combine the flour, salt, and lemon zest in a large mixing bowl. Drizzle the olive oil over the flour and stir that in as well. Drizzle the cold water over the flour and mix with a fork just until it is absorbed. Knead one or twice - just until the dough comes together into a ball. On a lightly floured surface use a rolling pin to roll the dough into a circle roughly 13-inches across. 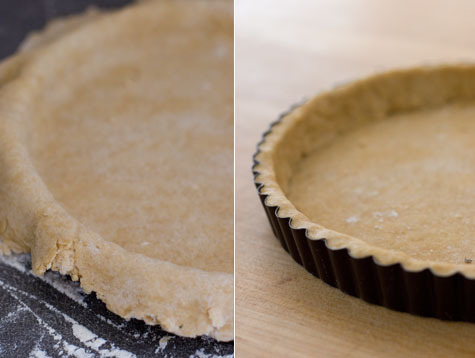 Ease the pastry into your tart pan and press it into the corners and up the sides without stretching the dough. Trim away any excess dough, and place the pan in the refrigerator for at least thirty minutes. When the dough is done resting, prick the crust with a fork a few times. Now line the pastry with parchment paper and fill the tart with pie weights. Bake for 15 minutes. Carefully remove the paper and pie weights, then toast the tart crust in the oven for another five minutes or so before transferring it to a rack to cool. Leave the oven on, but dial it down to 350F. In the meantime, you can make the sauce. Stir the garlic, olive oil, red pepper flakes, and salt together in a small, cold saucepan. Turn the heat to medium-high and cook until the garlic starts to sizzle just a bit. Stir in the crushed tomatoes, bring to a simmer, cook the sauce down a bit, 10 minutes or so, then remove from heat. When you are ready to assemble the tart, use a spatula to spread half of the ricotta cheese across the base of the tart shell. Now spoon about half of the sauce over the ricotta and arrange half of the zucchini in a single layer on top of the sauce (see image). If your zucchini is still quite wet, press it into some paper towels. I use my fingers for this next part. After spooning the remaining ricotta over the zucchini, push it around a bit with your fingers so that it forms a layer. Arrange another layer of zucchini and finish with the remaining sauce. You want the filling to nearly, but not quite fill the pan. Place the tart on a rimmed baking sheet - in case you end up with an overflow - and bake for roughly 40 minutes or until the tart is cooked through. Remove and let cool for 10 minutes before serving. I would have dusted the top of this with a bit of Parmesan, but was out of it! My favorite lasagna recipe. Dozens and dozens of whisper-thin sheets of fresh pasta brushed with the most vibrant red tomato sauce imaginable all intersecting layer after layer of warm, oozy, fresh mozzarella.